altE introduces a new series of lithium batteries designed for the residential solar market, decreasing costs and increasing compatibility with solar power equipment. altE Store announced the upcoming release of their proprietary KiloVault line of lithium iron phosphate (LiFePO4) deep cycle solar batteries. The batteries will be available for purchase in June of 2018. The KiloVault line is designed for residential energy storage consumers looking to take advantage of the benefits of lithium battery technology without entering the top tier of the lithium battery market. Initially there will be two KiloVault solar battery models; the 1800 HLX and the 3600 HLX—1800 Watt Hours and 3600 Watt-Hour capacities, respectively. The solar batteries are available on the altE website or via phone through their team of technical experts. From 2012 to 2017 the price of lithium-ion fell by 70%, a trend that greatly impacted the economics of residential energy storage. The price of lithium, coupled with advances in battery technology, has made easy-to-use residential lithium energy storage a cost-effective reality for more and more types of consumers. And with difficult-to-predict political interventions targeted at renewable energy—like fees from electric utility providers on homeowners with grid-tied solar—it increasingly makes more and more sense for consumers to store their own energy. Plus, electric grid unpredictability is increasingly becoming a reality due to more frequent and severe weather events, moving residential energy storage from the “nice to have” to the “need to have” category. Both initial KiloVault solar battery models were extensively developed and tested in heavy duty conditions to meet rigorous altE product standards. The batteries will work in 12 Volt, 24 Volt and 48 Volt configurations. They can be completely discharged 2,000 times and still retain 80% of their capacity. The batteries are almost completely maintenance free. Lithium iron phosphate (LiFePO4) chemistry does not suffer from the thermal run-away issues found in other lithium technologies and are 100% safe when handled properly. They come with a three year warranty backed by altE. The maximum configurations for both the 1800 HLX and the 3600 HLX allow for up to 28.8kWh and 57.6kWh of energy storage. Used at their full capacity, these batteries could provide enough energy for homes that consume over 1.5MWh of electricity per month. altE has been making renewable do-able since 1999. They’re one of the longest standing renewable energy equipment providers in the United States. altE’s headquarters and manufacturing facility is located in Boxborough, Massachusetts. altE has supplied solar equipment for projects on every continent in the world. Visit the altE website here. Call altE at 877-878-4060. 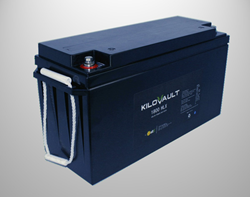 Learn more about the KiloVault lithium solar batteries here.